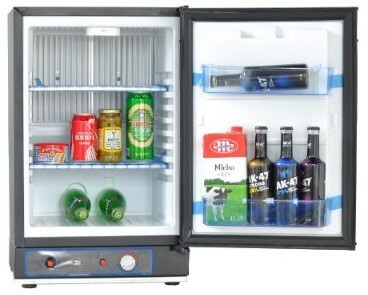 There is nothing better than a quality 12V fridge to keep your food and drinks cold 24/7. 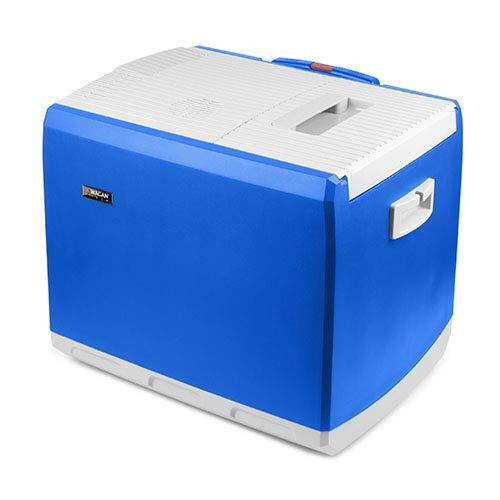 If you’re using a standard cooler in your camper van, you will incur loads of costs over time from spoiled food and buying ice every couple days. 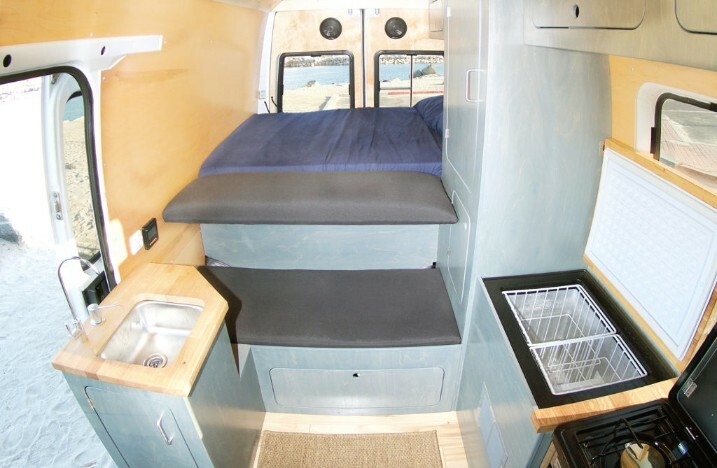 A portable mini fridge is going to be one of your biggest expenses during your van conversion. That being said, you will want to ensure you’re getting the best camper van fridge for your budget. We researched dozens of fridges to find the best makes and models for varying budgets and lifestyles. 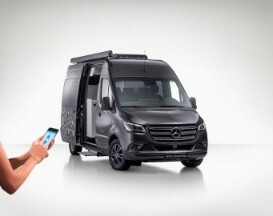 Whether you’re living the van life in a sprinter, cargo van, VW, skoolie, RV, SUV, minivan, truck or small car, we have a fridge that will be the right fit. Compressor fridges are powered by a compressor, similar to a standard home refrigerator. If you’re a full-time van dweller or on the road quite often, a compressor fridge is the best option. They’re incredibly efficient, relatively affordable, safe, reliable, versatile, and easy to install. As the name implies, these fridges are gas powered. If you’re dead set on using gas to power your fridge because you don’t have solar panels or you don’t want to periodically recharge your batteries, a gas fridge will be your best option. Gas fridges can be efficient, they run silently, and typically have a long lifespan, but they’re difficult to install, they can be dangerous, and the cost of gas will increase your long-term expenses. You can also power these fridges with electricity, however, they are very inefficient. 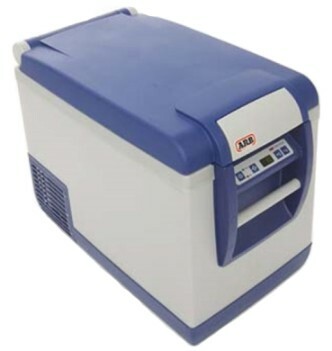 Thermoelectric coolers use electricity to remove hot air from inside the cooler, creating a cold environment to refrigerate your food and drinks. They can also be used to remove cold air, creating a warm environment. These are very affordable, but much less efficient and cannot reach nearly as low of a temperature as other options. 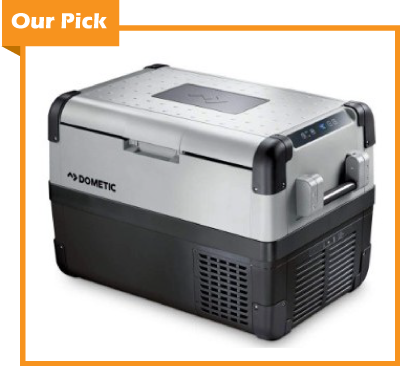 Dometic portable fridge/freezers are the best campervan fridges for various reasons. They are one of the most efficient portable fridges on the market with an incredibly low power draw, they’re reasonably priced, durable, and loaded with features. To name a few of the features, they include a digital control panel, LED interior light, USB port for charging your phone or other electronics, a drain plug, and removable wire baskets. There are other additional features depending on the specific Dometic model, which is all mentioned below. The W stands for WiFi, meaning the fridges have WiFi connectivity which allows users to adjust the fridge temperature with a phone app. This model also has a detachable and reversible lid. The DZ stands for dual zone, meaning there is a separate freezer compartment with a divider. Although it is a dual zone, it still only has one temperature gauge. But don’t worry, the freezer compartment will still stay colder because the majority of the cold air is trapped in that compartment. If you don’t want to use the freezer, you can remove the divider to allow for more fridge space. The W line still has a freezer compartment, it just doesn’t have the option to remove the divider. This model is unfortunately less efficient in terms of power draw compared to the W model, and is only available in 56 Quarts (CFX65DZ). It’s also a bit more expensive. The DZW is the best of both worlds. It has WIFI capabilities and the ability to remove the compartment divider. It also has two temperature gages, one for the fridge and one for the freezer. This option is only available for Dometic’s larger fridge/freezers. The ARB portable fridge has it’s pros and cons and is overall a fantastic fridge for a campervan, but not quite up to par with the Dometic fridges. 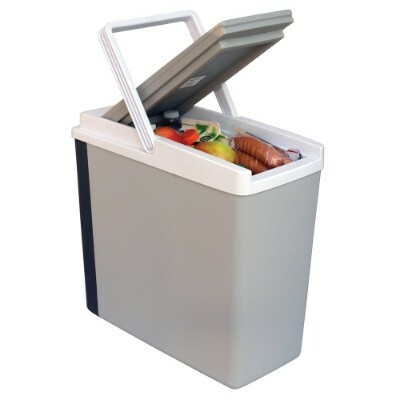 It has a super durable steel frame which makes it a great fridge for any sort of off-roading. 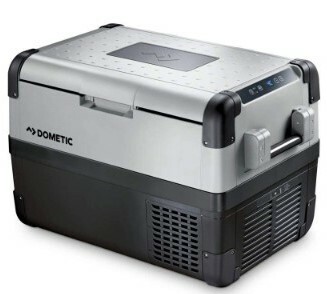 It also has a longer warranty, and similar to the Dometic fridges, it has a digital control panel, LED interior light, a drain plug, and removable wire baskets. The only downside is it’s slightly less efficient, slightly more expensive, and doesn’t include any advanced technology. 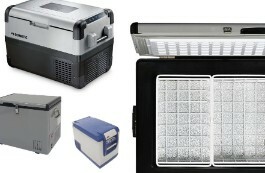 The Whynter Portable Fridge Freezers are a good option for the price, but they lack when it comes to efficiency. They have an LED temperature display, but they don’t have a separate freezer compartment, they’re a bit heavier, and only provide a 1 year warranty. 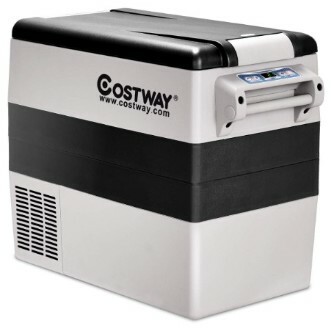 The Costway portable fridge freezer is for anyone living the van life on a budget. This is a very affordable fridge with all the basic features, but it has its cons. This fridge is not very efficient and you can’t expect it to have the long lifespan that you’ll see with other options – keep in mind that it only has a 3 month warranty. The Smad Gas fridge is one of few decent gas fridges on the market. A gas fridge isn’t recommended for van life, but if you’re dead set on using gas, the Smad is the way to go. This fridge has adjustable and removable shelves and will allow for electric hookup if need be. You get what you pay for with this cooler. It’s one of the best fridges for road trippers on a budget. It will keep your food and drinks cold up to 36°F below the ambient temperature and keep your food warm up to 140°F above the ambient temperature. It’s very lightweight and comes with magnetic/removable doors to keep your food cold/warm. Just keep in mind that this fridge is going to take a toll on your battery and have a tough time keeping frozen foods frozen. 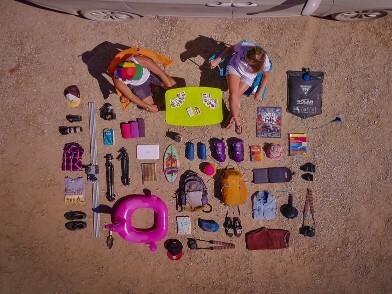 The Koolatron Cooler is another small, lightweight, affordable option for road trippers. It was designed specifically to fit right in between the driver and passenger seats in your car, truck, or minivan. Fridge efficiency is really important for van life. If you have yet to buy solar panels and batteries, keep in mind that you will need to spend more money on these if you buy an inefficient fridge. Most modern 12V refrigerator compressors are very efficient. Of course, some are slightly more efficient than others, but with better building and insulation materials, technology, and configuration, some companies can create a more efficient fridge with a lower power draw. You should know that the power draw listed by manufacturers is not always completely accurate. Testing conditions vary, making it difficult to provide accurate numbers. To ensure that we provide as accurate information as possible, we looked at the power draw listed by manufacturers along with numerous tests done by independent sources and customer reviews. Buying a mini fridge without enough capacity will require you to grocery shop more often and require you to dig around in your fridge when you need to find things. On the contrary, buying a fridge that is too big will cost more and take up more precious space in your van. 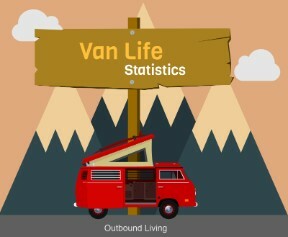 Most van dwellers traveling solo will use a 20 – 40 quart fridge, while couples will use a 40 – 60 quart fridge. You don’t want a fridge that’s going to break down on you or a fridge made with cheap parts that you will need to replace. Having a fridge with a longer warranty like an ARB (3 years) or Dometic (2 years), will not only ensure that you are covered if something happens to your fridge, but it also shows that they are confident that their product will last a long time. If you’re a full-time van lifer, skimping on an efficient, quality fridge is not recommended. However, portable fridges can get expensive so it’s understandable if you can’t fit one of the best fridges into your budget. Just keep in mind that you will spend much more money in the long run if you buy a cheaper fridge because they won’t last as long, you may need to replace parts, and most importantly, they won’t be as efficient which will require you to spend more on batteries and solar panels in order to make up for it. Chest fridges are more energy efficient, you can fit more items into them, easily portable, and you also don’t need to worry about your food falling out after a bumpy drive. The only downside is it will be more difficult to find your food at the bottom of the fridge. Upright fridges will make it easier to find your food, but after a bumpy drive, you may find your food falling out. They’re also less efficient, not easily portable, and there will be wasted space because things aren’t stacked on top of each other. You will want to put your fridge near your sink and stove/cooking device – whether this be in the front or back of your conversion van. You will also want your fridge to be easily accessible. If you have a chest fridge, the two best options are to put it in a pull out drawer, or use it as a part of your countertop. You can see the fridge on the right side of the van. It’s built into the cabinet so the lid is part of the countertop. Credit to vancraft.com. 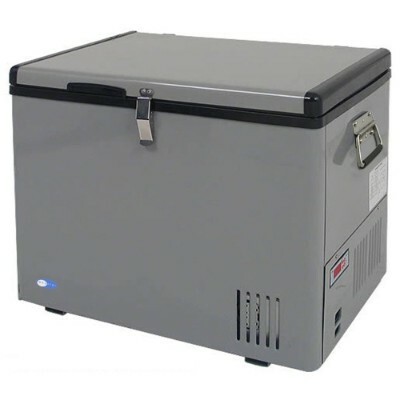 There are numerous portable fridges that include a separate freezer compartment. 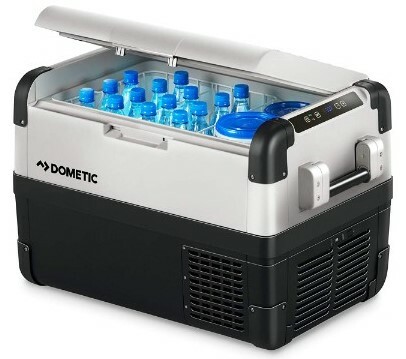 Dometic’s CFXDZ models have a divider in their fridge that is removable to allow users to expand the fridge area. Even fridges that don’t have a separate freezer compartment can still reach a freezing temperature on one side of the fridge allowing you to keep necessary items frozen. This, of course, isn’t as reliable and you will inevitably end up with food items that are colder or warmer than desired. Compressor fridges are powered by a compressor, similar to a standard home refrigerator. 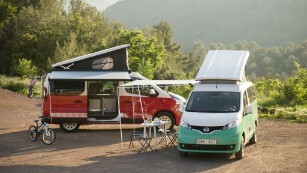 They’re the best option if you live in a camper van full time or are on the road often. As the name implies, these fridges are gas powered. They’re not recommended for van life. They should only be used if you don’t have solar panels or you don’t want to periodically recharge your batteries. Installation is more difficult – it must be inspected by a registered gas fitter. If it’s not inspected, your warranty will be forfeited and your safety will be at risk. Thermoelectric coolers use electricity to remove hot air from inside the cooler, creating a cold environment to refrigerate your food and drinks. They can also be used to remove cold air, creating a warm environment. These fridges are only recommended for those taking an occasional road trip.